Upon reaching these milestones by the end of 2018, the commuter railroads must implement PTC as soon as practicable and no later than Dec. 31, 2020. Strong and continuous progress is being made by the commuter rail industry toward installing and implementing Positive Train Control (PTC), according to an analysis by the American Public Transportation Association (APTA). These advancements reflect the commuter rail industry's commitment to safety and to implementing PTC by the statutory deadline. 91% of spectrum has been acquired. 85% of 13,698 pieces of onboard equipment have been installed on locomotives and cab cars etc. 79% of 14,083 wayside (on track equipment) installations have been completed. 78% of back office control systems are ready for operation. 74% of 14,847 employees have been trained in PTC. 34% of commuter railroads are in testing, revenue service demonstration, or are operating their trains with PTC. "Every year, 30 commuter railroads across America safely carry passengers on 501 million trips," said APTA President/ CEO Paul P. Skoutelas. "With safety as our number one priority, the commuter railroads are making strong and continuous progress in implementing Positive Train Control." Installed all PTC hardware (wayside and onboard equipment). Acquired all necessary spectrum for PTC implementation. Initiated testing on at least one territory subject to the PTC requirement (or other criteria). "Positive Train Control is a critical commuter rail safety enhancement," said SEPTA GM Jeffrey D. Knueppel. 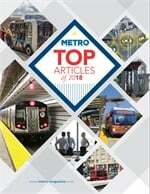 "Implementing PTC at SEPTA, during a challenging period of capital funding, has been an authority-wide commitment. Throughout this effort, our in-house team has been working continuously with Amtrak, our freight partners, and third-party contractors to address technical and interoperability challenges. SEPTA trains on all 13 Regional Rail Lines are equipped and operating with PTC, and SEPTA is proud to have implemented this safety technology for our customers and employees." "Implementing Positive Train Control in Chicago's dense and busy railroad network has been very challenging, but Metra is right where we said we'd be in terms of finishing the job," said Jim Derwinski, Metra's CEO/executive director. "Working with our freight partners, we expect to have PTC implemented or in revenue service demonstration on six of our 11 lines by the end of 2018, and to complete the job by 2020." 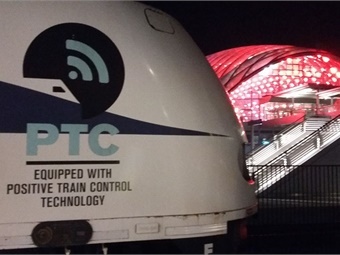 The commuter rail industry is moving aggressively to implement PTC as it faces considerable technical and financial constraints. At a time when the national transit state of good repair backlog stands at an estimated $90 billion, the commuter railroad industry's cost to implement PTC will exceed $4.1 billion, diverting funds from other critical infrastructure priorities. Since Congress mandated PTC, the federal government has awarded $272 million in PTC grants. Additionally, another $250 million was made available in May 2018.